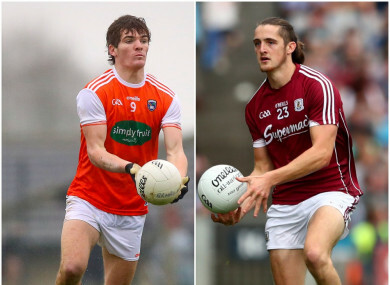 Armagh's Jarlath Óg Burns and Galway's Kieran Molloy were in opposition today. ST MARY’S COLLEGE Belfast claimed victory in the first Sigerson Cup game of the year, but they needed a free-taking competition to claim the win at a wintery Dangan. The teams finished level at 1-11 each after extra-time and after the sides both kicked their opening two frees – taken from the edge of the exclusion zone – Enda Tierney and Aaron Brady both missed kicks for NUI Galway and Niall Toner and Liam Rafferty made sure of the win. This was a typical Sigerson Cup clash played at times in heavy rain, strong wind and beaming sun, and for most of normal time it seemed as if the hosts would progress. NUI Galway raced into a 0-3 to 0-0 lead after 11 minutes thanks to a couple of Rob Finnerty points and another from Jack Robinson, but the 2017 champions had worked their way into the lead by the 26th minute when Aaron Boyle’s penalty beat Brady. Sligo’s Nathan Mullen helped NUI Galway reclaim the lead when he placed a wonderful shot to the St Mary’s net straight after the penalty, and they were good value for a 1-4 to 1-2 advantage at half-time. Finnerty’s free pushed Galway into a three-point lead again after the resumption, but St Mary’s finished the stronger and landed four of the last five scores to force extra-time. Both teams had players sent off in added-time – Patrick O’Donnell from NUI Galway and Ryan McSherry – for their involvement in a brawl, but with both side back to their full complement for extra-time Rafferty’s great score helped Mary’s into the lead. A super Michael Daly free from the left and Kieran Molloy’s score from the right looked to have sealed it for NUI Galway, but after Daly and Robinson picked up silly black cards, McConville sent the game to a free competition, and the Belfast side held their nerve. St Mary’s now go straight through to the next round, while NUI Galway need to win a back door play-off if they wish to progress. Email “Free-taking competition secures win for 2017 champions in opening game of the Sigerson Cup”. Feedback on “Free-taking competition secures win for 2017 champions in opening game of the Sigerson Cup”.